Another normal day at The United Nations. The United Nations on Tuesday continued to demonstrate that it is not an honest broker in the Israeli-Arab conflict as senior UN officials marked The International Day Of Solidarity With The Palestinian People. Richard Falk, the United Nations Special Rapporteur on “the situation of human rights in the Palestinian territories occupied since 1967” condemned Israel as a rights violator and occupier. “Every year, on this International Day of Solidarity with the Palestinian People, we are reminded of Israeli authorities’ invidious schemes to permanently empty Palestine of Palestinians. This entry was posted on Tuesday, November 29th, 2011 at 17:01 and is filed under Main Postings. You can follow any responses to this entry through the RSS 2.0 feed. You can leave a response, or trackback from your own site. 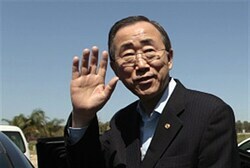 I refer to the UN Secretary General as Ban Ki Moonbat. And the UN can be renamed into Ummah Nazis.